The thickness, or depth, of concrete basement walls plays an integral role in their long-term strength and durability. Concrete foundation walls support the home standing above, so any weakness can undermine the stability of the house. The appropriate depth of the wall depends on several factors, and there is no single standard for every home. The concrete foundation of a new home. The taller the wall, the thicker it must be. When planning the thickness of foundation walls, the loads exerting pressure on those walls -- from the structure they support overhead, and the underground forces pressing against them -- must be considered. Soil can exert a strong pressure on basement walls; thicker concrete does a better job of resisting lateral stresses. In general, poured concrete basement walls that are 8 feet tall or less and have no more than 7 feet of soil pressing against them from the outside function well at a thickness of 8 inches. When a taller wall or a higher level of soil or both come into play, the thickness should increase to 10 inches. These figures can vary due to differences in local building codes. 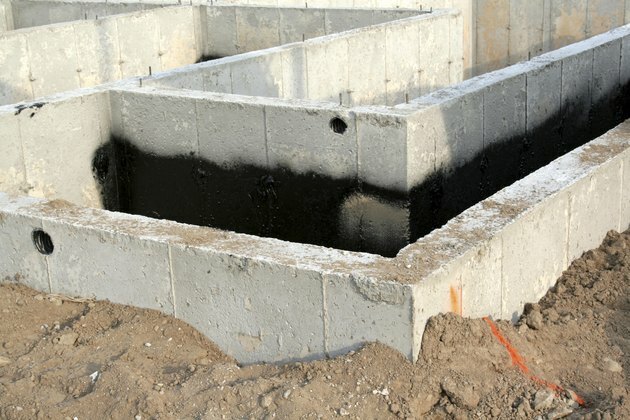 Although a thickness of 8 inches is typical for a home with 8-foot-high concrete foundation walls, an important exception exists. The 8-inch thickness works well for homes with most types of siding, but does not provide adequate support for a home with brick veneer siding. The veneer must rest on a ledge at the base the foundation, which necessitates increasing the thickness of the concrete to 10 to 12 inches. Reinforced concrete -- concrete walls that contain steel bars, or rebar -- offer more resistance to external stresses than concrete with no reinforcement. The rebar increases the wall's strength without expanding its thickness. In some situations, the rebar is critical to the structural integrity of the wall. For example, a hillside home that receives significant pressure from the soil could fail unless rebar is added to the concrete. When to Use a Schedule 80 PVC Pipe? How Thick Does Concrete Need to Be to Hold Up Weight?